Rogue One is quite simply one of the best Star Wars movies ever. It has an interesting plot, a tight script, good pacing, uniformly good acting, excellent special effects, amazing sets, spectacular new worlds, and dazzling battle scenes. I really loved this movie. When I first saw the teaser trailer I groaned. I thought it was going to be just a remake of The Force Awakens: a Mary Sue female lead, a multiracial cast, and another plot centering around the god-damned Death Star! Can’t these pathetic shekel-grubbing cynics at Disney come up with a single original idea? My jaundiced reading was well-grounded, based on the last Star Wars movie, Jar Jar Abrams’ absolutely abysmal The Force Awakens, which was a cynical, mechanical, character-by-character, scene-by-scene, sometimes shot-by-shot remake of A New Hope and The Empire Strikes Back, maximally pozzed with feminism and diversity, and completely lacking in the magic and humanity of the Lucas films. (See my review here .) The idea that Disney would follow this wretched remake with a remake of it seemed like a bad idea whose time had come. But I was delighted to be proven wrong. Rogue One is set in the Star Wars universe right before A New Hope. A few characters are present from the other films, but they all have minor roles. 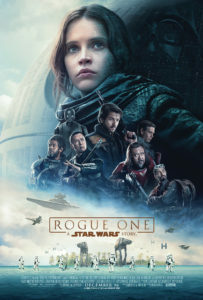 Instead, Rogue One adds a whole cast of new characters and a novel plot to the larger Star Wars saga, rather than remaking other films in the series or dining out on nostalgia for the cast of the original trilogy, as Abrams did. Yes, the cast is multiracial, with two very appealing Asian characters among the principals. But this is an Empire, after all, and set a long time ago, in a galaxy far, far away. It also seems dumb to complain about Asians and blacks on the screen when there are far more exotic races. In short, casting non-whites in Star Wars is not the same as putting them in stories like King Arthur or Robin Hood. And there was no attempt to match up the white female lead with a black, as in The Force Awakens. Rogue One is a movie for grownups. I would not take the younglings. The tone is dark and often quite moving, with touches of genuine humor that are never juvenile or crude. Mercifully, there are no Gungans and Ewoks, and nary a word of Nerf herders. Rogue One really is a war movie. Basically, it is The Dirty Dozen in space. Lucas’ droid and clone armies were created to deprive war of real loss, but they deprive it of tragedy and sublimity as well. In Rogue One, death is very real, often sudden, and always final. In the Lucas films, the rebels do nothing wrong. In Rogue One, they are every bit as ruthless as the empire. Diego Luna’s Cassian Andor is a battle-hardened spy, saboteur, and assassin. And he comes from the moderate faction. In the Lucas films, the Gungans and Ewoks represent the Third Worldist fantasy that primitives can triumph over technologically advanced war machines with bows, arrows, and slingshots. In Rogue One, the rebels meet firepower with firepower, until the Death Star rolls up and vaporizes them. Of course all that technological terror is no match for the Force, we are told in A New Hope. But in Rogue One, there is precious little Jedi swordplay, and it is not always superior to a well-aimed blaster. We learn that the Death Star thermal exhaust port was sabotage. The childish and petulant droid K-2SO, voiced by Alan Tudyk, was one of my favorite characters and provided most of the comic relief. Peter Cushing is digitally resurrected to play Grand Moff Tarkin, and it was uncannily well done. It has the best space battle ever. Director Gareth Edwards, who helmed the 2014 Godzilla remake, deserves enormous credit. This is arguably the best-directed Star Wars movie ever. The final act of this film is particularly intense, moving, and full of surprises. Where lesser films would have wrapped up, this film keeps pressing on to new heights — then topping them. There’s no “crawl” at the beginning, and frankly I did not miss it. Many of the lines and shots in the trailers were not in the movie. So if the trailers put you off, you have been mislead. The Schwartz was not with us. Aside from the casting issues already mentioned, this movie has no obvious Jewish subversion or propaganda, even though the screenwriters claimed it did. Vader’s battle scene was incredibly intense and will be endlessly re-watched and analyzed. Forrest Whitaker’s Saw Gerrera is fascinatingly realized: a Jedi turned terrorist, he is a wheezing cyborg like Vader, driven by murder and intrigue into gibbering paranoia. John Williams did not write the score, and he is sorely missed. Honestly, they should have just done a pastiche of his scores from the previous seven movies. I really wish Darth Vader had more screen time. He’s the only character from the other films I really wanted to see more of. They should have given him some of Grand Moff Tarkin’s lines. If the planetary shield on Scarif could prevent Jyn from transferring the Death Star plans, why did it not prevent Bodhi Rook from contacting the rebel fleet to tell them to expect Jyn’s communication? The crystals being removed from Jedah were not really necessary for the Death Star, if it could show up on the heels of the last departing ship to blast the place. A much more plausible cover for the destruction of the holy city would have been an asteroid strike. Rogue One is so superior to The Force Awakens that Disney should seriously consider just scrapping its new trilogy and instead focusing on making more “anthology” films set in the Star Wars universe. (But there needs to be an absolute moratorium on more Death Stars.) Jar Jar Abrams, of course, should never work in this galaxy again. But, frankly, Gareth Edwards will be writing his own ticket for many years to come. At the end of Revenge of the Sith, one feels a certain knowing pleasure in seeing how familiar things were brought about. One feels the same pleasure at the end of Rogue One, as it dovetails perfectly with the beginning of A New Hope. But the ferocious battles and fearsome sacrifices of Rogue One give the rebellion a new seriousness and sublimity, which will forever change how we view A New Hope and its sequels. Thus Rogue One is not just a great movie in itself, it will also deepen and elevate Lucas’ original trilogy. This is a remarkable achievement. I decided to re-watch the original Star Wars (which I hate to call A New Hope), to confirm my hypothesis that Rogue One will significantly change one’s experience of the original trilogy. And I was correct. One interesting detail that popped out is that, aside from the Emperor himself, Tarkin was apparently the only person in the galaxy who could say “no” to Darth Vader. In Rogue One, he sends Vader into battle. In Star Wars, he tells Vader to stop choking a subordinate and is “holding Vader’s leash,” as Leia puts it. In The Empire Strikes Back, Vader is unleashed, and his chokings are no longer mere warnings but a method of execution. I then went on to re-watch The Empire Strikes Back, and I must alter one aspect of my review above. (Pray I don’t alter it further.) The Empire Strikes Back really is the best Star Wars movie ever. Yes, the embarrassingly juvenile moments remain. Yes, Carrie Fisher is a princess only in the Jewish sense: spoiled, obnoxious, aggressive, and rude. But on the whole, the script, direction, acting, music, special effects, and overall feeling of darkness and dramatic seriousness are superior to any other Star Wars film — especially the third act in the cloud city, and the climactic “I am your father” scene, where Vader offers a proposition that, frankly, Luke should not have refused.